As we celebrate the 200th anniversary of Dr. James Parkinson’s groundbreaking essay of “The Shaking Palsy”, there seems to be a flurry of announcements of possible breakthroughs in diagnosis and treatment of Parkinson’s. Eight years ago, when I was first diagnosed with Parkinson’s, the prevailing theories all stated that PD was a disease that started with “dopamine-producing cell death in the brain.” Sometimes the cause was genetic. Other times exposure to pesticides or other chemicals were to blame. But most of the time, there was no apparent cause. Just 6 months ago, at the World Parkinson’s Congress, we began to hear about different ways of looking at PD. We have known for years, that Parkinson’s is a designer disease. The progression can be very different for each person. But now doctors and researchers are looking at PD as a group of syndromes, not just a single neurological condition that caused movement disorders. Many other symptoms and diseases not typically considered Parkinson’s were now seen as part of PD. There have been a lot of studies of possible treatments that seemed promising, but the hope for a cure still seemed elusive. In fact, one of the speakers at the WPC, whom I believe was Tom Isaacs, quipped that the cure was always 5 years away, no matter what the research said. can easily be absorbed in the gut, unlike treatments for the brain, which is protected by the blood brain barrier. There has been much written about this, and it is probably confusing for most of us who are not researchers. I am not a biologist, or a scientist, but I do understand that treating the cause much earlier, if it is in fact in the gut, is much easier that treating the damaged neurons in the brain, especially since symptoms don’t appear until it is way too late to reverse the damage. Last week the FDA approved Xadago (Safinamide) for people with Parkinson’s disease (PD) who are taking levodopa but experiencing “off” episodes. Also last week, researchers from the University of New Brunswick found that an extract from the brown seaweed Alaria esculenta can prevent this conversion and, therefore, could be useful in avoiding the onset of the disease or delaying its progress.” Ok. Does this mean we should eat more sushi? A new study published in the Annals of Neurology suggests that redheads may carry a gene variant that increases the risk of both Parkinson’s disease (PD) and melanoma. Researchers have long known that having either PD or melanoma heightens the chances of developing the other condition, but it’s been unclear exactly why. What if you are blonde and have had both, like I have??? I think this means I am in trouble…. The Food and Drug Administration finally gave approval for 23andMe to sell to consumers genetic tests and their accompanying health risk reports for up to 10 diseases, including late-onset Alzheimer’s and Parkinson’s. And finally, the New York Times declared that exercise is good for us old people. All kidding aside, it seems that the big breakthrough may just come in less than 5 years, which would make all of us very happy. Wow, it has been an interesting journey! I started writing this blog in March, 2015, as a way to share my experience with Parkinson’s Disease with others. I never imagined that I would still be writing almost 2 years later, with this my 100th post! 15 people read that first post when it was published. Now my subscribed readers number several hundred, with many more just checking in, coming from 76 different countries. I want to thank all of you for your support over the last 2 years. There has also been a world-wide effort to change the image of Parkinson’s from the stooped over, shuffling person to someone who is actively enjoying life with PD. Photographer Anders Leines‘ photo exhibit at the World Parkinson’s Congress was highly successful. There is also a Facebook page, Many Faces of Parkinson’s that is working to change that image. The World Parkinson Coalition has just published a book Faces of Parkinson’s: Global Reflections of PD which can be ordered through their website. Exercise has also been a positive force this year for PwP. Many studies have shown that exercise can be more beneficial in relieving Parkinson’s symptoms that anything else. See Exercise May Be Real Medicine for Parkinson’s Disease. Yoga, boxing and tennis keep me going. If you are not exercising, 2017 is the year to get moving. There are so many options, either in group exercise classes, online videos or just walking. Just check with your doctor before beginning any exercise program. I was fortunate to attend the World Parkinson Congress in Portland in September. This amazing conference brought together over 4300 people from around the world, People with Parkinson’s and their caregivers, doctors, scientists, and many others in related fields for 4 fabulous days. I am so glad that I met many of you there. 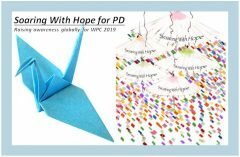 I hope that we can all meet in Kyoto in 2019 at the next WPC! Keep on moving: exercise every day. Keep a positive attitude. Look in a mirror and smile – it will brighten your day. Hug my grandchildren as much as possible for they are the best medicine! (Thank you Linda B for saying that). Have a wonderful and healthy 2017! The Poll Results are in! Thank you to all who responded to this most unscientific poll. What is your preferred form of Exercise for Parkinson’s Disease? On Tuesday I will be traveling to Portland for the WPC. I am looking forward to meeting up with friends from around the country, hearing about the latest research and learning about living life to the fullest with PD. I will try to post a summary everyday and will write more in depth after I return home. I will be volunteering in the Parkinson’s Foundation booth on Wednesday from 11:00-1:00. Stop by and say hello if you are there. In addition, if you would like to tell your Parkinson’s story, to be published in this blog at a later date, I would love to meet with you. Either stop by the booth, or contact me so that we can arrange to meet.